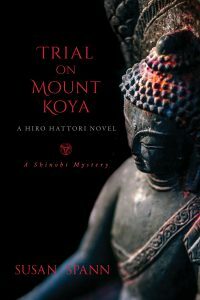 Today is release day for the newest Hiro Hattori mystery, TRIAL ON MOUNT KOYA! Every book I write becomes my new favorite, and this one is no exception. I consider KOYA my dual love letter to Agatha Christie’s AND THEN THERE WERE NONE (one of my favorite books, growing up) and one of Japan’s most sacred peaks. Koyasan (aka Mount Koya) is the heart of Shingon–esoteric–Buddhism in Japan. It’s a place where history, natural beauty, culture, religion, and some of the best food on the planet converge, and I fell in love with this holy place the first time I visited (on a whim, though I knew within hours that I’d be setting a book here eventually). I use “here” in the previous sentence because I’m spending release day, and the day after, hiking and climbing on Koyasan, and revisiting the places that inspired the locations in the book. As soon as I arrived, just after noon, I hiked to the top of Bentendake, one of the peaks that surround Koya’s summit. From there, I followed the historical “women’s trail” down the mountainside to the Daimon, or “Great Gate” – the official entrance to Koyasan, which was forbidden to women until the 19th century. As a symbolic gesture, I left the women’s trail at that point, bowed to pay my respects, and crossed through the gate on behalf of all the women who could not enter the sacred space during their lifetimes. While on Koya, I’m staying at Ekoin, a thousand year-old Buddhist temple. Although Myo-in, the temple in the novel, has a similar layout to Ekoin, Myo-in is entirely fictitious. Except for the fan and suitcase, however, this room is not very different from the one where my detectives, Hiro and Father Mateo, might have stayed on a visit to Koyasan during the 16th century. In Trial on Mount Koya, master ninja Hiro Hattori and Portuguese Jesuit Father Mateo carry a message to a ninja spy hiding on Koyasan, only to find themselves trapped on the peak in a snowstorm with a killer who’s murdering Shingon priests and posing his victims as the Buddhist judges of the afterlife. In an ironic twist, the weather report on Koya calls for thunderstorms starting in the middle of the night tonight (the night I arrived) and continuing for the next two days. Ordinarily, I might find that frustrating. Today? I call it poetic justice. I also call it the makings of some very atmospheric photographs. I’ll share them–and more about Koyasan–in the weeks to come. I hope to get some added to this post later today – but the storm is impacting the internet service here on Koya, and I can’t get them uploaded for the initial post. I only hope my stay is substantially less exciting than Hiro and Father Mateo’s adventure. Releasing a book is excitement enough for me! What’s your favorite sacred or powerful place to visit? What place in the world inspires you the most? *Loving your hat! * 🙂 Nice wide brim and love hiking with those myself – they keep you cooler and the sun doesn’t feel as hot – even if the weather is arduous, I find those hats to be a comfortable companion! Before I address your post, I wanted to answer your Q? My favourite place I’ve visited was Uxmal – the ruins set in the Yucatan peninsula? I even wrote a poem about it when I returnt home – as there was something rather attractive about being ‘lost’ in the lushness of the forest, where parrots flew overhead and where the echoes of the past were in the ruins themselves. I climbed two pyramids at this site and felt so *connected! * to Uxmal, the group I was travelling with couldn’t understand why I felt such a cosmic pull to stay and linger… I took loads of pictures, but it was how I felt walking through Uxmal and just taking moments of ‘stillness’ to let Uxmal leave an imprint of an impression on me which has lasted all these years lateron. I was sixteen when I travelled and spent eight lovely days spilt between three sites of ruins which even to this day, remain my favourite place I’ve visit. My only regret? Not having Mum and Dad alongside me – as they would have made for better travelling companions as they intuit and observe similar to me their experiences whereas the group I was with was beyond ‘typical’ of Westerners who don’t know how to appreciate localised culture, tradition and the enriching gift of experiencing a life outside our own elsewhere from where we live. — Sometimes the best places we visit on whimsical impulses become our most beloved places and cherished memories. I finally sourced a copy of *And then there were none* from my library – digging into it this week in prep for dissolving into *KOYA* — of all the lovelies I’ve read by Dame Christie, this is one of the titles I never had a fancy to read, though I do know of it as I was doing some sleuthing about how this could be as I, like you, read her stories as a child! She’s one of the key reasons I have a wicked fascinations with Mystery, Suspense & Thrillers today – keenly bent on Cosies and Cosy Historical Mysteries in particular (as you know!) and why I know at some point my own writings will take a suspenseful route themselves, as I seriously *devoured! * so many incredible Mysteries over the years, they are just a part of my life now! I love when you can get atmospheric shots when weather impacts your camera! I have experimented with fog and rain previously and sometimes the effects are quite surreal! I love the symbolic gesture you gave at the gate and the honour you left behind for the women who never could walk where your feet were now… it is a lovely moment of respect and of tucking in the pieces of the past which need to be reawakened in the future! I think my favourite bit to this post, outside of the treasured moments you were sharing on the trail itself were the insights into KOYA and of course, a bit of a murmuring about how sometimes everything aligns between our fictional worlds, our imaginations and the living realities we experience – sometimes, the line between the three are not as far off as they first appear,… I’m thrilled for you to be living through these excursions whilst you have a new book out! It brings everything right back to centre! Hello Jorie! The hat is wonderful. It really does such a fantastic job of keeping the sun and heat at bay – a lot of Japanese women (and men) wear hats like this when hiking. I actually purchased this one on one of my mountain climbs, at a shop near the summit. It has quickly become one of my favorite pieces of hiking gear!